When it comes to planning an event, food is an item that is high on the priority list. Why? Because people need to (and love to) eat! Food brings people together and having satisfied guests is what you strive for no matter the event – food does just that. Something that is great about catering an event instead of doing it yourself is that it makes your life easier – especially when you have a large number of people on the guest list. Many times, people don’t know the protocol when it comes to catering. We hope we can help you with this by providing the following do’s and don’ts below for catering events. Many times, you are planning an event well in advance. The problem with this? We forget about the weather. Is there a chance of rain? Snow? Will the weather be hot? Cold? Always have a backup plan for any type of weather you may encounter on the date of your event. Before talking to a caterer, know your budget. There are sometimes unexpected costs people forget to consider when catering an event. Having a set budget will help you determine everything from what menu items you should serve to how long you should have the caterer stay at the event. The catering staff knows what they are doing. If you have preferences for the staff, let them know ahead of time and not at the event. Typically the catering staff is more than willing to accommodate certain requests, but also keep in mind that this is their job and they work the way they do for a reason. Having a variety of menu options is best when serving a large crowd. Anyone planning an event should offer several choices so that all guests will be pleased with what's available. A couple of examples include serving all condiments on the side and providing a mix of indulgent and healthy options. Once you finalize everything with your caterer, stick to the plan. 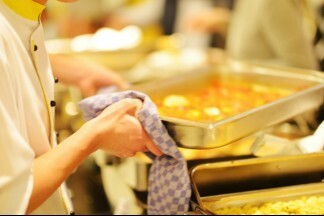 It’s hard for caterers to adjust once they have placed orders and are preparing for an event. Last minute changes can create unneeded stress and confusion. The majority of the time, a caterer will plan for a few extra guests, but having a large number of unaccounted people is not something a caterer is prepared for. Keeping the number consistent makes life easier not only for you and your guests, but also for the caterer. Plan ahead. It takes time for the caterer to order food and schedule staff to work at an event. If you need a caterer ASAP, you may not be able to get exactly what you want. Also, please remember to give the caterer enough time to set up prior to the event starting. There’s nothing worse than having a set up taking place as guests arrive. If you would like alcohol served at your event, make sure your caterer is licensed to do so. It is easy to forget that not every catering company is permitted to serve alcohol, so double checking is always a good idea. There are a number of do’s and don’ts that go along with catering. If you have any questions or are in need of a caterer for an upcoming event, please contact us.